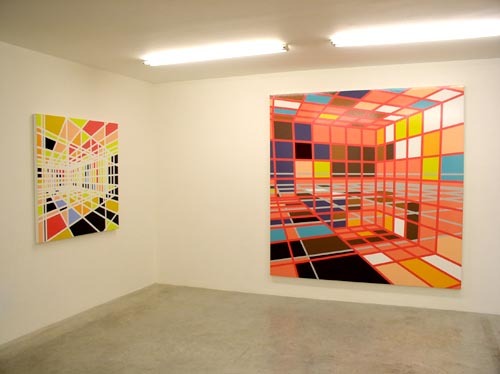 The American artist, Sarah Morris, has recently turned her attention to Miami, a place where the tourist industry intersects with the impacts of drug trafficking, immigration and exile. Her series of paintings, collectively entitled 'Pools', acknowledge the swimming pool as the ultimate emblem of Miami, encapsulating its particular lifestyle and ideology. The artist also locates the city's position in the production of the American dream in relation to the contradictions of US foreign policy, hinting at Miamis problematic relationship with Cuba, ninety miles to the south and its role in the history of the Cold War. As such, Miami is not just a portrait of a city, but continues Morris' study of artifice, surface and the covert. For her Paris exhibition the artist shows 5 new paintings from the 'Pools' series and her fourth film "Miami". Operating between a documentary, the biography of a city and a form of non-narrative fiction, "Miami" shifts between sites of production, leisure and work. The Coca-Cola bottling plant, the Grand Prix and the hotels of Morris Lapidus are just a few of the places that interweave in a driving sequence of urban images that combine towards a new ultra-vision of a place.